Mumbai, Jan 21: Heaping praises on Anupam Kher starrer ‘The Accidental Prime Minister’ senior BJP leader Subramanian Swamy said that the ace actor should be decorated for bringing the real-life political drama on the silver screen. Recently the Rajya Sabha MP along with members of Virat Hindustan Sangam attended the special screening of ‘The Accidental Prime Minister’ at Mumbai’s INOX Atria. 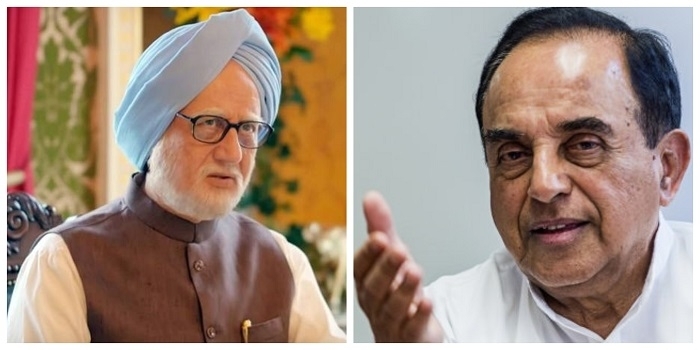 Recalling his old comradeship with former Prime Minister Dr. Manmohan Singh, Swamy also underlined the political development when his legal intervention had spoiled Sonia Gandhi’s aspiration for the post of the Prime Minister. “Accidental PM movie was for me who knows MMS for 50 years (whose tenure as PM made possible by me by blocking TDK was superb.” He Twitted. Released worldwide on January 11, the flick is based on the book penned by Dr. Manmohan Singh's former media adviser Sanjay Baru where the award-winning actor Anupam Kher has played the titular role and Akshaye Khanna essayed the character of Sanjay Baru. Debutant Vijay Gutte under the banner of pen movies helmed the prestigious project.